You will start your visit of the city from Michelangelo Square, a panoramic terrace with the best view of Florence. From up there the driver will show you the main sites of the city. Then you will drive down to the centre and by car you will see the Cathedral, the Baptistery, Signoria Square, Ponte Vecchio, Santa Croce Church and the Pitti Palace. Then you will have your free time to visit your favorite monuments in town. 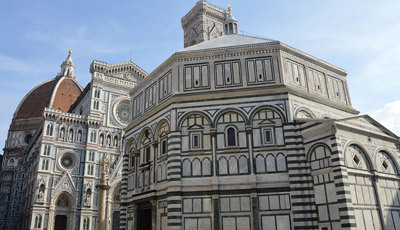 If you like we can reserve for you a Private Guide in Florence for the visit of the city and of the main museums.